But it's not as disastrous as it sounds! 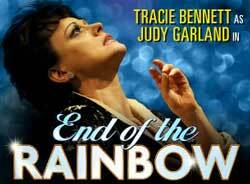 Tracie is the tour de force currently playing Judy Garland in End of the Rainbow at the Trafalgar Studios. It is an enormously demanding part, but somehow she has managed to do every performance - with the exception of tonight when the show is not on. Instead you can see Tracie on the Paul O'Grady show which is live on ITV1 at 9:00 pm tonight. End of the Rainbow closes at the Trafalgar Studios on 21st May, but is due to go on tour in the Autumn (full details to follow in the next few days) and is Broadway bound next year.